What is Mild? Mild is a beer style which developed in the late 18th and 19th centuries as drinkers started to demand a slightly sweeter and less aggressively hopped beer than Porter. Early milds were much stronger than modern versions, which tend to fall into the 3% to 3.5% category, though a number of brewers are bringing strength back into style. Mild is usually dark brown in colour, due to the use of well-roasted malts or roasted barley. Look for a rich malty aroma and flavour, with hints of dark fruit, chocolate, coffee and caramel, with a gentle underpinning of hop bitterness. What: As we’ve done for the past few years, the Amber Valley and Derby Branches of CAMRA are working together to run a Mild Trail throughout the month of May. Once again, there will be a Trail Card printed in Derby Drinker and each pub on the Trail will be issued with stickers, which can be obtained on the purchase of a half or pint of mild in each of the participating pubs. Where: A full list of the pubs, their addresses and opening times is in the magazine and listed here, and the Trail itself commences on Wednesday May 1st, finishing on Friday May 31st. For You: There is a reward for collecting the stickers – anyone with at least 20 from either Amber Valley or Derby will be entitled to a free pint at the Amber Valley CAMRA Beer Festival later this year, so collect your stickers, keep them safe as the Festival isn’t until the end of September, and enjoy your free pint! Of course, anyone who manages to collect at least 20 stickers in both Amber Valley and Derby will be able to claim 2 free pints. To Do: There will also be CAMRA Certificates for the winners in both Trails, and here’s where we need your help. As you visit the pubs on the Trail, keep a note of your experience in each, and send us your top 3 pubs in each Branch area if you get to both. 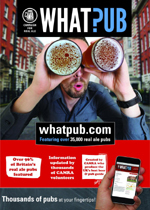 This will help us to work out which pubs are this years winners, and there are numerous ways that you can get in touch – we have a dedicated Trail email address GomildinMay2019@gmx.com , a Facebook page GO MILD IN MAY (@mildman19), or you can text us on 07982 943 944. The top pub receives 5 points, the second 3 and the third 1, and once the Trail ends the winners are notified. Please remember to send a top 3 – while single pub nominations are accepted, the nominated pub will receive only 1 point, so there’s no real benefit to the pub concerned. Plus: Voting is open to anyone, whether they are CAMRA members or not, but we do have a further request to members – as you sample the many varieties of mild on offer, please give the beer a mark out of 5, which can be done on whatpub – you just need to sign in, locate the pub concerned and press the “submit beer scores” button. This is very important for the pub concerned as it helps us to decide on our Good Beer Guide entries. Finally, we hope that you enjoy the Trail, visit some great pubs and sample some wonderful mild in each one.